Of course, it is unlikely that both NATO and Russia are completely ignorant of how their actions in Europe are interpreted by the other, but, as Posen continues, “Often it does not matter if they know of this problem. The nature of their situation compels them to take the steps they do.” In this sense, a security dilemma can resemble an intensified balancing-of-power born of a particular time and place and revolving around a particular international political crisis. In the context of the crisis in Ukraine and current NATO-Russia relations, whether their actions are viewed from an offensive realist (power maximisation) or defensive realist (security maximisation) perspective, a security dilemma between NATO and Russia appears to be in effect. Russian and NATO military exercises, of which there have been many already this year as “part of a rapid militarization on both sides of the Russian frontier”, are perhaps the most readily identifiable component of the dilemma. This is suggested by the pattern and nature of these activities. For instance, in March this year, Russia conducted a large snap exercise (comprising a series of geographically dispersed smaller exercises) across the country in “one of the Kremlin’s biggest shows of force since its ties with the West plunged to Cold War-lows”. Shortly after followed NATO’s ‘Operation Dragoon Ride’, involving the transportation of military vehicles and personnel from the Baltic states to Germany in “the longest [convoy] that Europe had seen since the Battle of the Bulge, in 1944”; it was designed to “show the world some of the firepower the United States and its NATO partners have in Eastern Europe”. Then in May, NATO conducted ‘Exercise Hedgehog’ just across the Russian border in neighbouring Estonia with a record number of Estonian troops in “the biggest military exercise in the nation’s history”. In the face of perceivably aggressive behaviour by the other, NATO and Russia have increased not only the scope and number of their military exercises, but also their operational military activities and deployment of weaponry in Europe – as is widely documented – in apparent attempts to enhance their respective security. 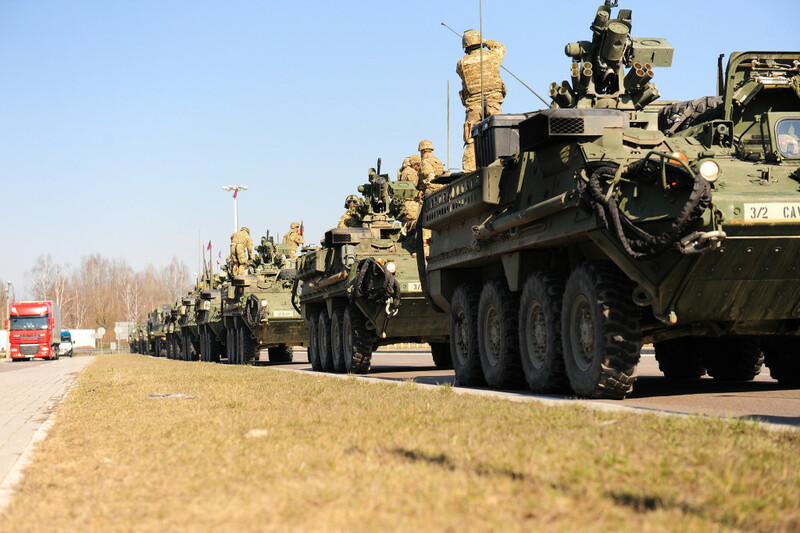 As a prime example of how this can reinforce the security dilemma, in June the US put forward plans to station heavy weapons and vehicles in Poland and the Baltic states for the first time since the end of the Cold War in response to Russian actions in Eastern Europe. From NATO’s perspective – and likely from the perspective of some non-NATO European states – such deployments would help enhance NATO and European security through traditional, hard power means. Yet Russian perception did not involve seeing this as defensive behaviour – quite the opposite. Russian Defence Ministry official General Yuri Yakubov said that “if heavy US military equipment, including tanks, artillery batteries and other equipment really does turn up in countries in eastern Europe and the Baltics, that will be the most aggressive step by the Pentagon and Nato since the Cold War…” Yakubov added, critically, that such actions would directly prompt Russia to “organise retaliatory steps to strengthen our Western frontiers.” Moscow perceived NATO’s stated defensive deployment as aggressive behaviour yet further threatening Russian security and so requiring and legitimising an adequate, defensive response. This could consequently provoke additional defensive measures from NATO, possibly and ironically of a kind similar to that which prompted Russia’s earlier defensive action. In a similar pattern that illustrates the importance of differing perceptions and interpretations of actions and responses, Russia has explained its naval operations around the waters of Scandinavia and the Baltic states as being in response to breaches of its airspace by NATO aircraft. NATO in turn has explained these as part of efforts to maintain the defence of its own (and European) airspace against provocative flights and intrusions by Russian aircraft. And there are numerous other examples of this dynamic involving such defensive and responsive deployments and operational military activities. Consider how, within the context of escalating NATO-Russia tensions, both parties continually emphasise the defensive (whether reactive or pre-emptive) impetus underscoring their development of increasingly more comprehensive and advanced military capabilities, from missile defence systems to strategic nuclear bombers. The current pattern of tensions between NATO and Russia bears key hallmarks of a security dilemma. Military exercises, operational military activities, and deployments of military hardware are invariably explained by both sides as constituting defensive measures enacted out of necessity in response to the aggression or provocation of the other. Barry Posen’s warning that “what one does to enhance one’s own security causes reactions that, in the end, can make one less secure” seems a pertinent observation as the cycle of ‘defensive response’ to ‘defensive response’ maintains or raises tensions between NATO and Russia. “The Ukrainian crisis is a reflection of a major conflict between Russia and the Euro-Atlantic structures. It may lead to a catastrophe if the ongoing arms race, military viagra pas cher provocations and confrontational rhetoric is not stopped,” states a recent open letter to the German government signed by nearly thirty influential German figures. Slowing this downward ‘spiral’ and achieving some level of stability – a cooling of tensions – should involve a stronger recognition by both sides of the threat perceptions of the other, plus, perhaps more importantly, a stronger understanding of how military actions taken to supposedly enhance each side’s own security may actually be helping to sustain the very tensions that prompted them.